OXFORD, U.K., Oct. 12 /CSRwire/ - Leading global insurance provider, Aviva Plc, has been awarded a prestigious UN Momentum for Change award, in recognition of the company’s flagship and fully comprehensive action to tackle climate change. With the importance of avoiding a plus-two-degree world high on the international agenda, the award highlights how reducing emissions internally, and investing in high quality carbon reductions beyond business boundaries, is best practice action for building a sustainable global economy. Aviva has been a completely climate-neutral business since 2006, supported by the climate and development B-corporation, ClimateCare. Both Aviva and ClimateCare are members of the UN’s Climate Neutral Now coalition. Aviva achieves climate neutrality by first reducing emissions as far as possible, and is aiming for a 70% reduction in energy consumption by 2030, based on a 2010 baseline. Its actions include the installation of solar PV on three of its UK office locations, and sourcing 61% of its electricity from renewable sources. Aviva then works with ClimateCare to offset its remaining emissions, by supporting a variety of international projects, which in addition to reducing carbon emissions, help alleviate every-day challenges for communities in developing countries. To date these projects have improved the lives of over 970,000 people. ClimateCare designed the offset programme to reflect Aviva’s international market presence and supply chain countries. The current projects that Aviva supports operate in India, Vietnam and Kenya, helping to transition local markets to commercially viable, appropriate, low-carbon technologies. 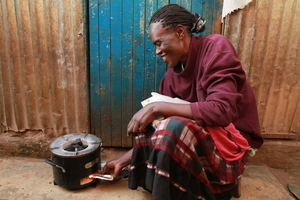 One of these projects, the Burn Stoves programme in Kenya, is helping thousands of households gain access to the ‘Jikokoa’ – a market leading fuel efficient cookstove. Utilising innovative ‘natural draft’ technology, the stove achieves more complete combustion of charcoal fuel than conventional stove models. This technology reduces fuel demand and smoke emissions, not only saving users money on fuel, but also decreasing their exposure to health-damaging indoor air pollution. The production of these stoves is employing over 100 people in the project’s Nairobi-based factory, with half of the positions held by women. Supporting projects like Burn Stoves through voluntary and compliance carbon market mechanisms, allows Aviva to fully compensate for the emissions generated at its 16 international business locations, whilst it continues to invest in internal emissions reductions. The projects also contribute to several of the UN’s Sustainable Development Goals, such as SDG 3, “Good Health and Well-being”, and SDG 7, “Affordable and Clean Energy”. Robustly measuring these sustainable development outcomes has been a core component of the partnership between ClimateCare and Aviva. Together, they pioneered the application of the London Benchmarking Group framework for carbon offset projects, setting the standard for how businesses report the impacts of their carbon offset programmes. By recognising the integrity of Aviva’s climate strategy, the UN’s award highlights the essential role that carbon markets play in allowing companies to take complete responsibility for their contributions to climate change. Carbon finance is important for kick-starting and nurturing low-carbon initiatives around the world, and is essential to the operation of projects like Burn Stoves. Aviva joins the other award winners in Bonn in November, to showcase their leading examples of corporate climate action.